Read this article on the Loughrey sisters from Derry. Found it fascinating reading. Just wondered if anyone had any pictures of the sisters? Can't seem to find any of them on the net. Ken McCormack continues his occasional look at some personalities and characters in Derry and the North West in years gone by . . .
On a crisp December afternoon in 1975 a wisp of smoke curled its way into the cloudless blue sky from a back garden in Derry's Waterside. Soon, what seemed like an innocuous fire became a blaze as file after file of private papers and souvenirs were heaped upon the flames. Itâ€™s reckoned that information worth millions of pounds was burned that day along with invaluable records and other material of immense local interest. Onlookers would not have realised it but what they were seeing was the result of a secret pact â€“ the last bizarre chapter in the history of one of Derryâ€™s most noteworthy and eccentric families, the Loughreyâ€™s of Clooney. Derry has produced some remarkable personalities in its time and surely high on the list must be the Loughrey sisters, who had the pet names of Bird and Dill. They were known as the Miss Loughreys (sometimes the Misses Loughrey) and were famed the world over as breeders of Scottish Deerhounds - large, thick- coated dogs, with very docile temperaments. 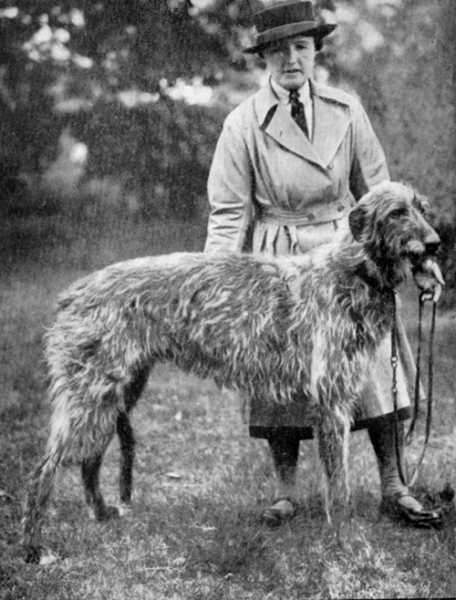 Bird and Dill ruled the deerhound scene between the 1920s and the 1960s. The sisters were as different as chalk and cheese. Bird, properly named Florence, was the elder of the pair. She was attractive, petite and quite feminine, while her younger sister Dill, or Hylda Mary, was haughty and domineering. Dill is remembered for her outlandish appearance â€“ she wore a shirt and tie, a tweed jacket and a tweed skirt reaching down to her brogue shoes. But perhaps the most remarkable item of her attire was her pork pie hat. This was her trademark and it was rumoured that she bought a dozen of these bizarre hats at a time. So it was not in the Loughrey temperament to be a shrinking violet and Bird and Dill maintained the tradition. They would frequently be seen around Derry perched regally in the rear of their Riley beach wagon with brother Edward at the wheel. Edward was a retired brigadier whoâ€™d served in the Sudan and had been something of a big game hunter in his day. As a result, heâ€™d brought back some very unusual souvenirs to Derry â€“ among these was a fearsome tigerâ€™s skin rug, two giant elephant tusks and the stuffed heads of several wild animals. You might well believe that visitors to Rosslyn, the Loughrey home at Clooney, were awe-struck with the sight of such weird trophies. Eccentric or not, Bird and Dillâ€™s fame as Deerhound breeders brought them adulation wherever they went. It was said that no one could match Dillâ€™s handling of dogs in the show ring, while Birdâ€™s ability to spot a future champion was unequalled. Dill eventually became a renowned judge at Cruftâ€™s. She was President of the London-based Deerhound Club for 28 years and joint Secretary/ Treasurer with Bird for 23 years. All of which brought them great friendships with very wealthy people, owners of vast country estates, mansions and castles â€“ a select band of people. When in London the sisters stopped at the magnificent Brownâ€™s Hotel in Mayfair, whose past guests have included kings and queens, Theodore Roosevelt, Rudyard Kipling and Agatha Christie to name but a few. And so popular were they that on the way to and from London they were personally welcomed on board the Belfast boat by the captain and escorted to the best cabin. A mark of the Loughrey fame came when the Kennel Club of Britain commissioned a 21-inch high bronze of the great champion Prothetic of Ross for their permanent exhibition. Incidentally, this dog was so valued that it was taken to America for safety during World War II. The mystery of their success . . . 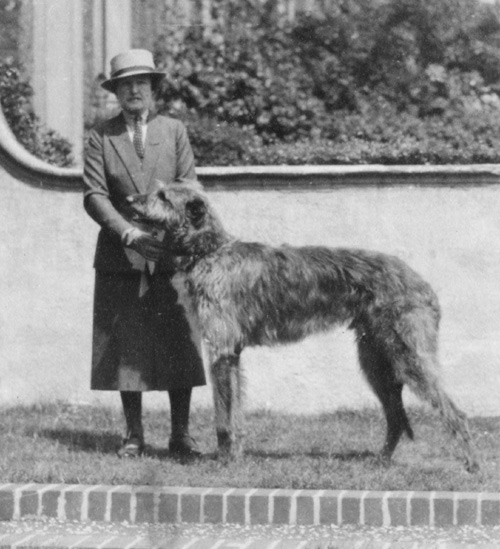 But, while Bird and Dill Loughrey dominated the Deerhound world throughout the 1900s from their Derry home, it always prompted one question â€“ what was the secret of their outstanding success? Herein lies a mystery that was eventually to lead to a bizarre pact between the sisters and it has left us with an unsolved riddle. The puzzle surrounds the debate about the connection between Scottish Deerhounds and Irish Wolfhounds â€“ at first glance both breeds seem not unsimilar. Yet Bird and Dill maintained that only the Scottish Deerhound was pure bred and that the Irish Wolfhound was a crossbreed produced in the1800s. To make matters worse, a relation of the Loughreys, Major H D Richardson, was partly responsible for the new Wolfhound strain and this led to fierce internal family feuding. In the end Bird and Dill Loughrey declared war on all Irish Wolfhounds and their owners â€“ even mention of the name was enough to set Dill off at full tilt. Yet some wondered did they protest too much? What Brian saw was the famous Loughrey linen cupboard under the stairs in Rosslyn. It almost had the status of a shrine for it was here that world-class deerhounds first saw the light of day. All the Loughrey champions had names ending in â€˜icâ€™, such as Ledric, Magic, Cleric, Osric and dozens more. But according to Brian one of them left its mark across the entire strain of Scottish Deerhounds everywhere â€“ Tragic of Ross (b.1923). This name appears on practically every deerhound pedigree. It is the gold standard. But, are we any nearer to discovering how the Loughreys came to shape the world of deerhound breeding? What was the Loughrey secret? To understand we have to take a closer look at the sisters. Firstly, both were very versatile â€“ believe it or not Dill had been a welder in an air plane factory during World War I, while Bird had been a nurse treating soldiers with horrendous injuries. Bird later patented a cough balsam known as Miss Loughreyâ€™s Syrup of Carageen Moss. It was said to ease away the winter blues and was popular throughout the 1940s and 50s. Then we have to remember the assertive, sometimes flinty, Loughrey temperament - how the family came to prominence at Binnion near Clonmany in Donegal back in the 1800s is a story for another day. The house is still there. Safe to say that it is the stuff that legends are made of and it left the sisters unshakable in anything they pursued â€“ people in the world of dogs simply took their words as gospel. The sisters also gave their lives totally to their dogs. And here thereâ€™s a word of caution for ladies who aspire to breeding Scottish Deerhounds. Apparently statistics show that where women are concerned, once they become addicted to the charm of the deerhound they want nothing more to do with men! The Miss Loughreys were a case in point and some might argue that they even set the trend. Certainly one girl who came under their spell was the wealthy and beautiful heiress Nessy Linton, who had a string of young suitors. Nessy bought Dramatic of Ross from the Clooney kennels, won at Crufts (1932) and thereafter showed all of her young men the door. But to get to the real heart of the mystery we have to move to the twilight of the Loughrey years in Derry. By the 1960s the sisters had considerably reduced their dog breeding activities â€“ Dill was still judging at Crufts, while Bird was writing for the Our Dogs newspaper. Then one evening in the drawing room at Rosslyn they made an amazing decision â€“ a pact that was to deny the world any details whatsoever of their champions, of their breeding expertise, or anything of their family affairs. The pact amounted to a similar clause in each of their wills. This stated that which ever of the sisters survived would arrange for every single piece of information relating to the Loughreys to be burned. Odd to relate, news of the pact leaked out to the dog fraternity and it sent shock waves through the Kennel and Deerhound Clubs. As a result plea after plea was made to Bird and Dill not to destroy their priceless records but it was to no avail. Then, as if to oblige, fate lowered the curtain on Derryâ€™s most eccentric pair. Bird was crossing the road at Dalesâ€™ Corner in the Waterside in 1969 to post an obituary to Our Dogs newspaper when she was struck by a military vehicle and died instantly. Dill never recovered from Birdâ€™s death. A shadow of her former self she tried to continue judging but eventually withdrew into her own lonely existence and died on 13 December 1975. In true Dill form before she departed she neatly boxed and labelled everything that was to be consigned to the flames â€“ a fortune. A dog breeder told me that the material burned in the garden at Rosslyn would be worth millions of pounds today. Also lost was the history of the family including several epic tales of the Loughreyâ€™s and their forebears. The minds of breeders went back to the deerhound - wolfhound argument. Rightly or wrongly some pondered the unthinkable. Did Bird and Dill Loughrey secretly use an Irish Wolfhound to refine their Scottish Deerhound stock? If true it would have been the equivalent of an earthquake amongst the dog breeding fraternity. As it turned out the answer went up in flames in December 1975 and to this day it still remains the Loughrey secret. A short time ago while researching a history project in Dublin I called on an old friend of Bird and Dill Loughrey. â€˜I remember them well,â€™ my host told me. â€˜In fact, they left me a souvenir of Rosslyn!â€™ I was led to a spacious drawing room and gasped, for there taking the whole length of a wall was a giant elephant tusk. No amount of endeavour on my part could move it and I wondered if the indomitable sisters were smiling down on my efforts with their customary self- assuredness! Thoroughly enjoyed this article. Thanks for posting. Nice bit of intrigue here - were Deerhounds polluted /refreshed with Wolfhound blood? Hmmmm. I was especially amused by the suggestion that women who breed Deerhounds are at risk of giving up men entirely! I read that bit out to my husband. Thank you Scott for your post with this interesting article. No problem, glad you both found it interesting. Managed to find a couple of pictures from Kilbourne Deerhound's website of one the sisters, Bird Loughrey. Thanks Scott for your post with the interesting pictures. Thanks for the link Joerg. Tragic of Ross looked like a fine d/h. I like the athletic type. Doesn't look like anyone knows much on the forums regarding the Loughrey Sisters. It seems to be pretty hard getting any info on historical matters in the DH world. Last Edit: 6 years 8 months ago by saorsa. Thank you Scott for your post with the PDF file. The article with the interview with Pat M. Aird, â€œSHENVALâ€ is very interesting. I have print me the article for my little archive. Neil you wrote "... we love the traditional looking deerhound as opposed to the broader headed show hounds." That remark intrigued me. Had to give it some thought before I replied. I wonder how widespread that opinion is in the UK concerning perceived changes in modern Deerhounds? I think the traditional, athletic type deerhound is much better as well. In my humble opinion some of the "top kennels" dogs look nothing like a proper deerhound to me. More like big, hairy wolfhounds. Last Edit: 6 years 6 months ago by saorsa. I think formerly was good Deerhound characterized by good hunting successes. I think the optic was very different. Last Edit: 6 years 6 months ago by Joerg Yoki. Hopefully the kennels who still breed d/h closer to the original shape and size keep breeding and find success in shows as well. And aren't edged out by the "top kennels"..
Richard wrote: Neil you wrote "... we love the traditional looking deerhound as opposed to the broader headed show hounds." I too like the deerhound type I first saw over 40 years ago. This year at Crufts I thought there was a greater representation of the "athletic type" among the younger dogs. I don't speak to many owners as we don't show,but wondered if there may be a misconception that greater bulk=strength=better fitness for purpose. I just wonder how many of the heavy solid type would be able to leap over the heather clad hills? I concede that my only DH is too fine boned for the ring and possibly for pulling down deer(although she is deceptively strong) but we love her elegant shape and head - just what we hoped for. She is also as swift as the wind and loves running up hills and leaping through woodland. Also Richard, I wondered if any studies had found if there is a correlation between longevity and type? Last Edit: 6 years 6 months ago by crackadog. I think the only thing that might come out of any study like that is: that greater size is not likely to improve the chances of longevity. However, I don't believe there are any such studies related to "type" and longevity, but we do know of course of a number of studies related to longevity in dogs in general. And a ton of stuff trying to understand it in a biological context. Of course I too believe type has been lost progressively over the years, and I don't just mean from 1880 to 1920, when one could say the original type was replaced by the show type, but as you say in the last 40 years. And I'm always careful to try and find corroboration or rejection, to test my opinions. We know the size and type of the Deerhounds that were used to pull down cold coursed red deer in the Highlands. We no longer see that type in the modern show ring. My last Deerhound, a male, was a fast and strong dog and I have no doubt that in his junior and middle years would have had no problem bringing down a Deer. He did however become quite heavy in his late years and would then most likely have become too slow, he weighed 57Kg when he died although was much lighter when younger, he was 31/32 inches tall. My current Deerhound, a female, is very fast and agile (See Picture of her jumping on Home Page) she is 29/30 inches but only weighs 34Kg and I very much doubt that she'd have the strength to do so. Also are we taking into account the fact that many dogs throughout history would have been more able in their prime years than in their younger or older years? What was the length of their working life? I have emailed you Richard- let me know should it go AWAL in cyberspace! I am a novice in the world of deerhounds having only had Finn for as little as three years but, like many if not all owners, I am besotted with these magnificent hounds and look forward to the day of owning more and showing them. My preference is based on the old photos I have seen on this site and of the ones I have seen in the flesh at meetings and shows, the latest being a Stranwith hound at the Limited show. She was absolutely beautiful. crackadog and Joerg, "Longevity" is on its way.